Find out about our annual projects in the LUX* Integrated Annual Reports. It’s too late to save the dodo, but we believe in doing everything we can to preserve the rich diversity of wildlife that still makes its home in Mauritius. LUX* Resorts & Hotels is proud to sponsor the Mauritian Wildlife Foundation’s conservation of the Ile Aux Aigrettes. This beautiful lagoon islet is covered with coastal forest, which provides a peaceful home to a spectacular kaleidoscope of trees, plants, birds and reptiles. We intend to keep it that way. 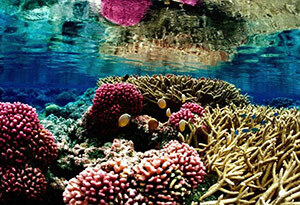 One of the defining characteristics and biggest attractions of the Maldives is its extraordinary aquatic ecosystem. The waters around Dhidhoofinolhu, home to LUX* South Ari Atoll, teem with marine life. To understand and protect it, LUX* has created a dedicated on-site Marine Biology Centre, with a special focus on the conservation of the world’s biggest fish: the whale shark. Alongside this environmental project, LUX* Resorts and Hotels provides funding for a range of social-development and educational initiatives undertaken by South Ari Atoll’s Dhigurah School and the Youth Foundation Movement of Dhigurah. Launched in 2002, Reef Check Reunion operates over 20 stations on land and at sea to monitor the stability of the reef’s development, protecting the sustainable evolution of the marine biodiversity of Reunion Island. LUX* Saint Gilles and Hôtel Le Récif have support the NGO through funding and by providing a platform for further promotion of the association’s work. Through its project “ROUTE DU CORAIL©, the NGO trains volunteers to ensure efficiency in all its stations, invests in empirical data analysis and sensitises through communication to the general public and physical presence on the coast.